2006-03-01 First worldwide family litigation filed litigation Critical https://patents.darts-ip.com/?family=31949801&utm_source=google_patent&utm_medium=platform_link&utm_campaign=public_patent_search&patent=US20050181431(A1) "Global patent litigation dataset” by Darts-ip is licensed under a Creative Commons Attribution 4.0 International License. FIGS. 4A and 4B schematically illustrate different isolated views of a flow cell incorporated into the reactor systems of FIGS. 3A and 3B. FIG. 4C shows a schematic illustration of an integrated reactor system including computer control and substrate translation elements. Monomer/Building block: A monomer or building block is a member of the set of smaller molecules which can be joined together to form a larger molecule or polymer. 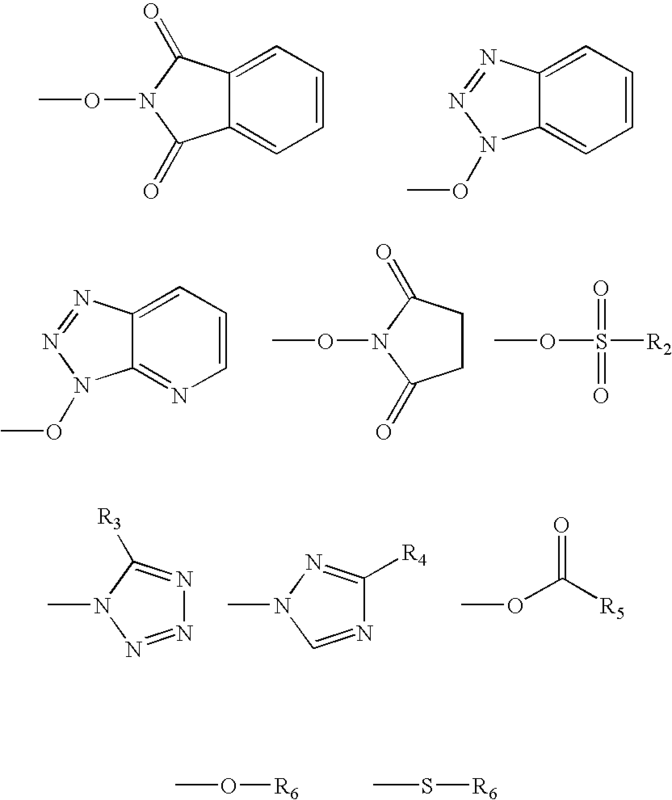 The set of monomers includes but is not restricted to, for example, the set of common L-amino acids, the set of D-amino acids, the set of natural or synthetic amino acids, the set of nucleotides (both ribonucleotides and deoxyribonucleotides, natural and unnatural) and the set of pentoses and hexoses. As used herein, monomer refers to any member of a basis set for synthesis of a larger molecule. A selected set of monomers forms a basis set of monomers. For example, the basis set of nucleotides includes A, T (or U), G and C. In another example, diners of the 20 naturally occurring L-amino acids form a basis set of 400 monomers for synthesis of polypeptides. Different basis sets of monomers may be used in any of the successive steps in the synthesis of a polymer. Furthermore, each of the sets may include protected members which are modified after synthesis. In the batch processing mode, a number of substrate wafers are subjected to an activating step 24. The activated substrate wafers are then pooled 26 and subjected to a monomer addition step 28. Each substrate wafer is then subjected individually to additional activation steps followed by pooling and monomer addition. This is repeated until a from which a plurality of individual arrays or chips may be fabricated. The term “array” or “chip” is used to refer to the final product of the individual array of polymer sequences, having a plurality of different positionally distinct polymer sequences coupled to the surface of the substrate. The size of a substrate wafer is generally defined by the number and nature of arrays that will be produced from the wafer. For example, more complex arrays, e.g., arrays having all possible polymer sequences produced from a basis set of monomers and having a given length, will generally utilize larger areas and thus employ larger substrates, whereas simpler arrays may employ smaller surface areas, and thus, less substrate. In order to ensure maximum efficiency and accuracy in synthesizing polymer arrays, it is generally desirable to provide a clean substrate surface upon which the various reactions are to take place. Accordingly, in some processing embodiments of the present invention, the substrate is stripped to remove any residual dirt, oils or other fluorescent materials which may interfere with the synthesis reactions, or subsequent analytical use of the array. 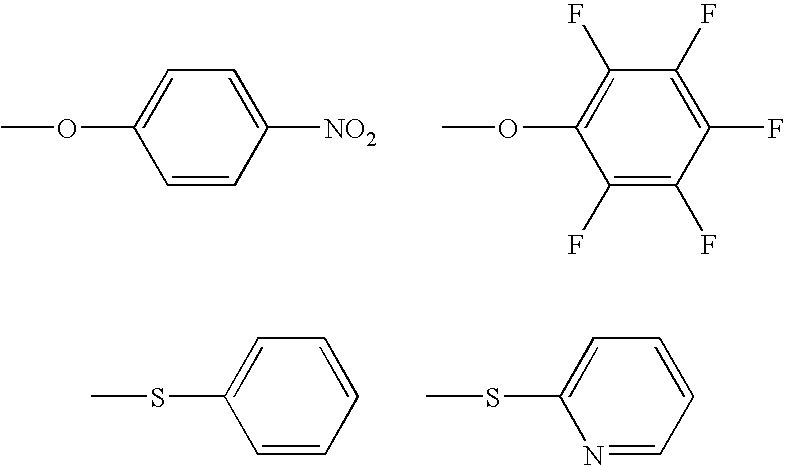 Examples of additional photosensitive protecting groups which may be used in the light directed synthesis methods herein described, include, e.g., 1-pyrenylmethyloxycarbonyl, α,α-dimethyl-3,5-dimethoxybenzyloxycarbonyl, 4-methoxyphenacyloxycarbonyl, 3′-methoxybenzoinyloxycarbonyl, 3,5′-dimethoxybenzoinyl-oxycarbonyl 2′,3′-dimethoxybenzoinyl-oxycarbonyl, 2′,3′-(methylenedioxy)benzoinyloxycarbonyl, N-(5-bromo-7-nitroindolinyl)carbonyl 3,5-dimethoxybenzyloxycarbonyl, and α-(2-methyleneanthraquinone)oxycarbonyl. Conditions for carrying out this transfer are similar to those used for coupling reaction in solid phase peptide synthesis, or for the capping reaction in solid phase oligonucleotide synthesis. The solid phase amine, hydroxyl or thiol groups are exposed to a solution of the protecting group coupled to the leaving group, e.g., MeNPOC—X in a non-nucleophilic organic solvent, e.g., DMF, NMP, DCM, THF, ACN, and the like, in the presence of a base catalysts, such as pyridine, 2,6-lutidine, TEA, DIEA and the like. In cases where acylation of surface groups is less efficient under these conditions, nucleophilic catalysts such as DMAP, NMI, HOBT, HOAT and the like, may also be included to accelerate the reaction through the in situ generation of more reactive acylating agents. This would typically be the case where a derivative is preferred for its longer term stability in solution, but is not sufficiently reactive without the addition of one or more of the catalysts mentioned above. On automated synthesizers, it is generally preferable to choose a reagent which can be stored for longer terms as a stable solution and then activated with the catalysts only when needed, i.e., in the reactor system flow cell, or just prior to the addition of the reagent to the flow cell. A schematic illustration of one embodiment of an integrated reactor system is shown in FIG. 3C. The device includes an automated peptide synthesizer 401. The automated peptide synthesizer is a device which flows selected reagents through a flow cell 402 under the direction of a computer 404. In a preferred embodiment the synthesizer is an ABI Peptide Synthesizer, model no. 431A. The computer may be selected from a wide variety of computers or discrete logic including for, example, an IBM PC-AT or similar computer linked with appropriate internal control systems in the peptide synthesizer. The PC is provided with signals from the ABI computer indicative of, for example, the beginning of a photolysis cycle. One can also modify the synthesizer with a board that links the contacts of relays in the computer in parallel with the switches to the keyboard of the control panel of the synthesizer to eliminate some of the keystrokes that would otherwise be required to operate the synthesizer. Reducing the size of the transmissive portion of the mask allows diffraction, scattering and divergence at the edges of each feature without that diffraction interfering with neighboring features. Thus, the region of incomplete photolysis can be centered on the desired boundary between features. As a result, the total area of the chip that is compromised in a multi-step synthesis is minimized because bleed-over effects from each region are centered in the boundary rather than well into the neighboring feature. Accordingly, in one aspect of the present invention provides a method of minimizing bleed-over in adjoining cells by reducing the size of the transmissive portion of the mask, such that the zone of divergent light shown through the mask is centered on the desired feature border. As an example, a mask exposing a rectangular feature can be reduced by, e.g., 20 μm in each dimension, thus allowing greater homogeneity at the edges of 100 μm features. In preferred aspects, the translucent region of the mask will be from about 2% to about 25% smaller in each dimension of the size of the region which is to be exposed. In more preferred aspects, the translucent portion of the mask will be from about 10% to about 25% smaller in each dimension. Examples of suitable coating materials include antireflective coatings that are well known in the art and generally commercially available, e.g., magnesium fluoride compounds, which are light-absorbing in the desired wavelength range, polymethylmethacrylate coatings (PMMA), which have a refractive index comparable to glass substrates, and polyimide coatings which are both light-absorbing in the desired wavelength range, and have a refractive index close to that of a glass substrate. Polyimide coatings are most preferred. Depending upon the protecting groups to be removed, the time required for complete deprotection in these solutions ranges from several minutes for “fast” base-protecting groups, e.g. PAC or DMF-protected A, C or G and Ibu-protected C, to several hours for the standard protecting groups, e.g. benzoyl-protected A, C or G and Ibu-protected G,. By comparison, even the fast protecting groups require 4-8 hours for complete removal in aqueous ammonia. During this time, a significant percentage (e.g., 20-80%) of probes are cleaved from a glass substrate through hydrolytic cleavage of the silane layer, whereas after 48 hours of exposure to 50% ethanolic ethylenediamine solution, 95% of the probes remain on the substrate. Upon completion, the cartridged substrate will have a variety of uses. For example, the cartridge can be used in a variety of sequencing by hybridization (“SBH”) methods, sequence checking methods, diagnostic methods and the like. Arrays which are particularly suited for sequence checking and SBH methods are described in, e.g. U.S. patent application Ser. No. 08/505,919, filed Jul. 24, 1995, Ser. No. 08/441,887, filed May 16, 1995, Ser. No. 07/972,007, filed Nov. 5, 1992, each of which is incorporated herein by reference in its entirety for all purposes. Usually, hybridization is performed by first exposing the sample with a prehybridization solution. Next, the sample is incubated under binding conditions for a suitable binding period with a sample solution that is to be analyzed. The sample solution generally contains a target molecule, e.g., a target nucleic acid, the presence or sequence of which is of interest to the investigator. Binding conditions will vary depending on the application and are selected in accordance with the general binding methods known including those referred to in: Maniatis et al., Molecular Cloning: A Laboratory Manual (1989), 2nd Ed., Cold Spring Harbor, N.Y. and Berger and Kimmel, Methods in Enzymology, Volume 152, Guide to Molecular Cloning Techniques (1987), Academic Press, Inc., San Diego, Calif.; Young and Davis (1983) Proc. Natl. Acad. Sci. (U.S.A.) 80: 1194, which are incorporated herein by reference. In some embodiments, the solution may contain about 1 molar of salt and about 1 to 50 nanomolar of targets. Optionally, the fluid delivery system includes an agitator to improve mixing in the cavity, which shortens the incubation period. Finally, the sample is washed with a buffer, which may be 6×SSPE buffer, to remove the unbound targets. In some embodiments, the cavity is filled with the buffer after washing the sample. Following hybridization and appropriate rinsing/washing, the cartridged substrate may be aligned on a detection or imaging system, such as those disclosed in U.S. Pat. No. 5,143,854 (Pirrung et al.) or U.S. patent application Ser. No. 08/195,889, filed Feb. 10, 1994, Ser. No. 08/465,782, filed Jun. 6, 1995, Ser. No. 08/456,598, filed Jun. 1, 1995, incorporated herein by reference for all purposes. Such detection systems may take advantage of the cartridge's asymmetry (i.e., non-flush edge) by employing a holder to match the shape of the cartridge specifically. Thus, the cartridge is assured of being properly oriented and aligned for scanning. The imaging systems are capable of qualitatively analyzing the reaction between the probes and targets. Based on this analysis, sequence information of the targets is extracted. Synthesis of MeNPOC-tetrazolide was carried out as follows: Tetrazole (7.0 g); 100 mmole) was combined with 17.5 ml of DIEA (13 g, 100 mmole) in 100 ml of THF, and a solution of 30 g (110 mmole) MeNPOC-chloride (See, Pease, et al, supra) in 100 ml THF was added dropwise over 20 minutes while stirring under argon at 4° C. Stirring was continued for an additional hour at room temperature. 200 ml of hexane was then added. The precipitate was collected by filtration, redissolved in 200 ml DCM and washed 3 times with 0.05 M aqueous HCl to remove DIEA.HCL. The organic layer was dried with NaSO4 and evaporated to obtain 24.5 g (80%) of the pure product, which was identified by 1H-NMR, IR and mass spectrometry. (d) an outlet in fluid communication with said reagent chamber. 51. A flow device according to claim 50 wherein said first mechanism for moving said sealing member moves said sealing member into engagement with said support. 52. A flow device according to claim 51 comprising said support in engagement with said second mechanism adapted to engage said support on a surface opposite said surface engaged by said sealing member and said first mechanism for moving said sealing member into engagement with said support, wherein said support comprises a chemical array.